Home › Travel Posts › World Glimpses › Contemplating Cambodia? What did I see in Cambodia? Where to begin? I went to Cambodia to see Ankor Wat; that was a big complex with amazing statuary and reliefs. At the front entrance was a wide road with a line of demons and a line of gods on either side. Each line faced the incoming people and yet you felt they were watching each other; they seemed to be locking their arms around a rope. (I was told the demons and gods were engaged in a tug of war, pulling at a huge sea serpent that was wrapped around an underwater mountain housing the elixir of immortality.) Ankor Wat did not disappoint. I went to a traditional dance demonstration with Aspara dancers who wore tall golden headdresses while they gracefully danced. At the show, the audience was seated cabaret style and the snack served with my beer was a grilled frog; it was crunchy. I had a foot massage by the Garra rufa and watched the mobs of tiny fish attack my feet. The S31 prison from the Pol Pot era (1975-79) was sad and filled with brutal detail. But the present day street scene was fun. I recall seeing a bicycle with a six foot stack of horizontally placed sticks held in place by one long vertical stick, a speeding motorcycle with a few pigs tied to each side and another motorbike had chickens dangling by their legs from six long horizontal poles; approximately twenty chickens on each pole flapped in the wind. White Brahmin cows, huge hay stacks and stilt houses filled the space. 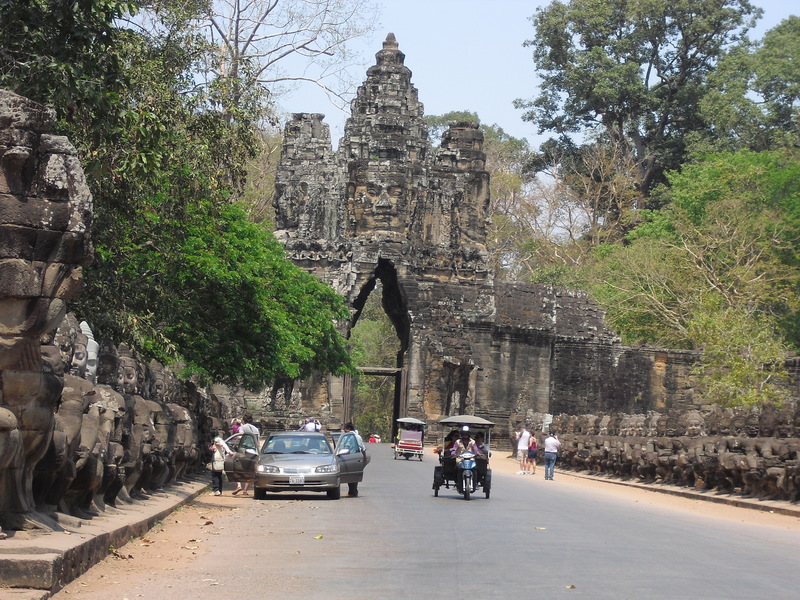 A sign in the former capital city of Angkor Thom said the city’s population in 802-1432 A.D. was one million while London’s population then had been thirty thousand. I remember seeing my passion fruit frozen daiquiri; it looked like honey mustard in a cocktail glass. At five feet, five inches tall, I was very tall there so I could see a lot! I recommend you give Cambodia a try. Say Su-say-day (hello) for me. TATTOO—Journeys on My Mind by Tina Marie L. Lamb is available at Amazon and BarnesandNoble and iBooks. Get an ebook or paper book now.